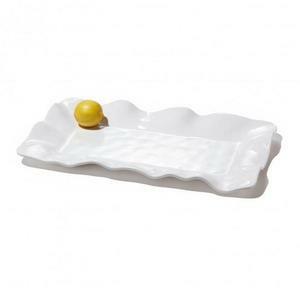 With the substance, weight, and appearance of a kiln-fired ceramic piece, this handy and handsome long melamine platter is designed for everyday enjoyment, perfectly suited for indoor and outdoor entertainment. Ideal for serving bread and cheeses, you may pair the platter with our other white melamine pieces for a coordinated serving set, or mix and match with our coral or aqua Havana Collection items for a festive table display. Pairs beautifully with any items from Beatriz Ball’s signature metal line, too.